What does math have to do with knitting and crocheting? Of course, counting stitches is a practical lesson, as is the study of proportion and gauge, but design and construction of projects can be turned into a lesson in math that is both fun and enlightening for older students. The creative mathematician team of Pat Ashforth and Steve Plummer can show you how to do this in your classroom. Ashforth and Plummer, husband and wife, have both taught high school math in the United Kingdom for more than 30 years and each share a passion for textile arts. It was their combined interests that resulted in "Mathghans," afghans designs to teach math skills. "The math to be learned from the construction and finishing of afghans depends on the ability level of the group involved. It can vary from simple counting to Pythagoras' Theorem and way beyond. 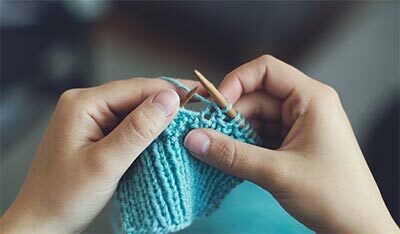 Any child with the coordination necessary to knit could be involved in a project; those without the necessary coordination could be involved in the design process." Check out their web site. 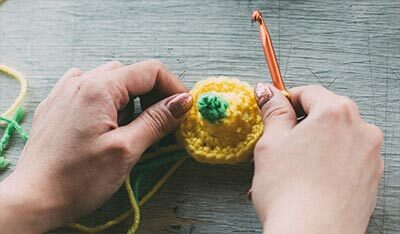 Crochet is also used to teach higher forms of math such as hyperbolic space, a geometric form that is generally difficult to describe to students and to model. (Imagine the crenellated or wavy edges of lettuce leaves or unusual coral shapes.) Cornell University professor Daina Taimina realized that she could create a hyperbolic plane with crochet, which helped her students to visualize this complex concept. For more background on this crochet application, visit The Institute for Figuring. On a less complicated level, crochet shapes have been used to help students visualize triangles, squares, rectangles and other basic geometric shapes. 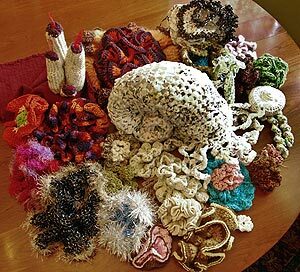 Crocheted coral reef shapes designed for The Institute for Figuring's Reef Project.